With its luminous beauty and classic gray-white coloration, moonstone makes an unexpected but elegant choice for an engagement ring. Many moonstones even feature internal fractures, which provide flashes of iridescence worthy of such a special ring. Although finding these rings is a bit more challenging than more traditional alternatives, you'll have plenty of shopping options to choose from. 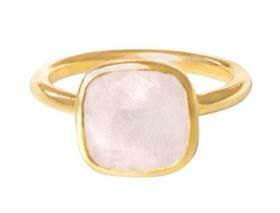 Moonstone rings are available in a wide variety of styles. Whether you love handcrafted jewelry or want a ring with romantic, antique style, there's a ring out there that's perfect for you. Some settings are designed to let the moonstone be the star of the show. These simple rings are ideal for brides to be who love classic jewelry. Claire Gold Moonstone Ring - This simple and affordable option from Fig Tree Jewelry is delicately beautiful in gold-plated sterling silver. A lightly faceted half-inch moonstone is set in a protective bezel and placed atop a thin band. This ring comes in sizes five through seven and retails for about $50. Monhegan Moonstone Engagement Ring - This handmade design from TurtleLove.com features a smooth one-centimeter moonstone cabochon prong-set in recycled sterling silver. The center gem is highly polished to show off the blue and green iridescent flashes, and the simple silver band offers a classic background. This ring is custom made in sizes six through nine and retails for $250. The subtle glow of a moonstone looks spectacular when accented with the eye-catching sparkle of diamonds. If you love jewelry that will turn heads, this type of ring may be a great option for you. Moonstone Bea Ring - This gorgeous design from Anna Sheffield is crafted in your choice 14k yellow, rose, or white gold and features a six-millimeter by eight-millimeter emerald-cut faceted moonstone in the center. On either side, trillion-cut white diamonds, totaling 0.14 carats, reflect the fiery beauty of the center gem. The thin band has a knife edge, and the gems are held in place with prongs. This exceptional ring comes in sizes three through 13 and retails for $3,200. Moonstone and Diamond Ring - In this stunning design from Richter's Jewelry & Design Studio, a cabochon-cut moonstone that has a carat weight of 6.12 carats is accented by a row of twelve, round, bead-set diamonds. The simple setting is crafted in 14K white gold. This ring retails for just under $3,700. Oval Moonstone and Champagne Diamond Ring - This beautiful 10k rose gold ring from Zales features an eight-millimeter by six-millimeter oval moonstone cabochon surrounded by 0.25 carats of enhanced champagne diamonds. The diamond color and rose gold offer a warm sparkle to the cool glow of the moonstone. It comes in sizes six through nine and retails for about $430. Although it is technically a type of labradorite rather than actual moonstone, rainbow moonstone is similar in value. It offers exceptional fire and makes a gorgeous choice for an engagement ring. Rainbow Moonstone and Sapphire Ring - This gold-plated sterling silver ring from Gemporia features a highly polished round moonstone flanked by blue sapphires for a total carat weight of 4.41. It retails for about £68. Moonstone and Sterling Silver Ring (pictured)- A polished rainbow moonstone cabochon is set in split shank, sterling silver band in this pretty design available on Amazon. The ring comes in sizes six through 12 and retails for about $60. Pear Rosette Ring - This exceptionally beautiful option from Anna Sheffield features a pear-cut rainbow moonstone surrounded by tiny diamonds. The buyer can choose round, oval and cushion cuts and the halo of diamonds is available in a variety of colors.. It comes in sizes three through 13 and retails for $600. Before you choose a moonstone ring you like, it's essential that you understand a few things about this gem. In addition to its one-of-a-kind appearance, moonstone has a number of properties that can affect your choice. A Hindu myth says that the moonstone was created with moonbeams solidified into stone. 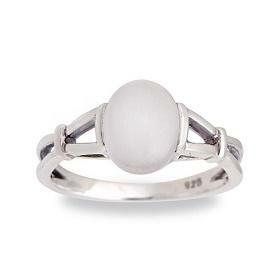 Many cultures believe the moonstone brings good luck to those who wear it, a sweet quality in an engagement ring. Some feel that the moonstone allows you to see the future. The "fire" or flashes of color and light that you see inside a moonstone are created by internal fractures and layers of minerals. Each moonstone is unique, which means buying one without seeing it can be problematic. Moonstones can have varying degrees of fire, and the color flashes can be blue, green, purple, pink, and many other shades. Before you settle on a specific ring, make sure you can view it in person or return it to the store if you do not feel it has enough fire. Your engagement ring should be perfect for you, and that includes finding the ideal moonstone centerpiece. Depending on your lifestyle, durability concerns can make moonstone a poor choice for an engagement ring. If you work with your hands or plan to wear your ring every day, you may want to select a different center gem. If you love moonstone and want a more durable ring, choose one with a protective bezel setting rather than prongs. The metal surrounding the gem can help support it and offer a buffer against damage. Because it is such a soft and fragile gem, you'll need to use extra care when cleaning and wearing your moonstone engagement ring. Always remove the ring if you'll be using harsh chemicals or abrasives. To clean the ring, use only mild soap and warm water. Other chemicals can etch the surface or damage the delicate nature of the internal fissures. Although it may not be the most practical choice for an engagement ring, a moonstone makes a captivating and unusual gem to symbolize your love. If you enjoy the history and mythology surrounding this gem and love its beautiful fire and soft glow, you'll have a variety of shopping options. Try on a few styles to find the engagement ring that will bring you joy for years to come.